Take a tumble through the jungle and go ape for the latest addition by Pragmatic Play. This classic slot game takes you to the exotic jungle where all spins will have wild animals and swinging vines fill the screen and offer you entertainment for hours on end. Visit Slotsbaby to know more! This 9 pay line, 3-reel slot machine is fast-paced and easy to play so you can spend less time learning to play and more time actually playing! With up to 9x multipliers on offer and a jackpot of 2500 on offer, these cheeky monkeys are well worth a bet! If you love promo's, check our casino deposit bonuses today. 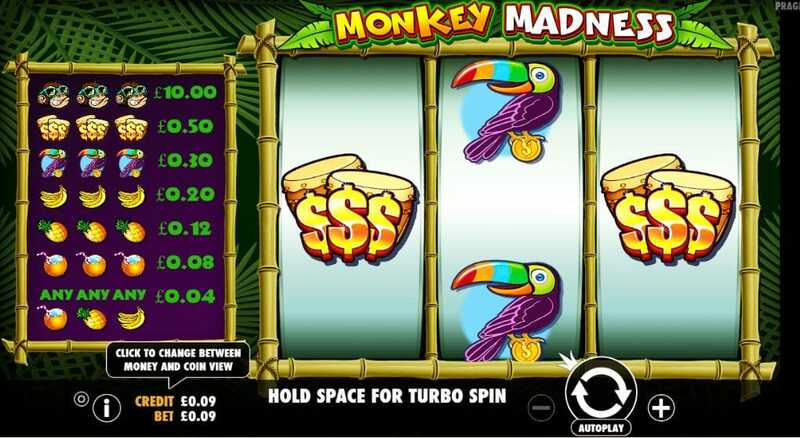 Monkey Madness is an online slot machine which can be played from as little as 0.09 or up to 45.00 per spin and it has been optimised to play on any of your favourite laptop, desktop, tablet or smartphone devices! 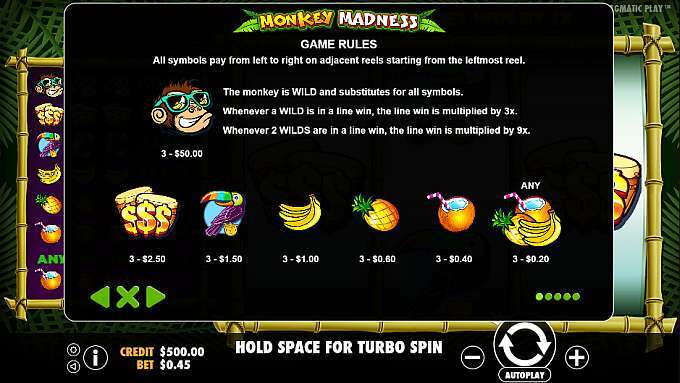 As with all slot games, Monkey Madness has a range of symbols to look out for as they can make winning combiations. The lowest value symbols include the Coconut, Banana and Pineapple. There are medium pay outs that come with the Toucan and Drums symbols, and the highest value symbols include the Monkey symbol, which also happens to be the Wild, meaning it acts as a substitute for all other symbols on the reels. This game keeps it simple like the classics and doesn't have a lot of the fancy bonus features you would typically find on newer online slots today, but that doesn’t mean it isn't fun to play. As mentioned above, the Monkey is the WIld symbol in this game which means he acts as a substitute for all other symbols on the reels. When one Wild substitutes in a winning combination, the pay-out will be affected by a 3x multiplier. If two Wilds substitute a winning combo, the pay-out will be affected by a 9x multiplier. If you get 3 Wilds substituting a winning combo, it will result in the highest pay-out in the game. Monkey Madness adds a fun and nostalgic spin to the slot game and reminds players of the classic slots in times gone by. It is easy to play and each spin is exciting, giving you the chance to win some great cash prizes, so it is definitely worth playing today! If you enjoyed this Slot the you can also play Keno Neo.